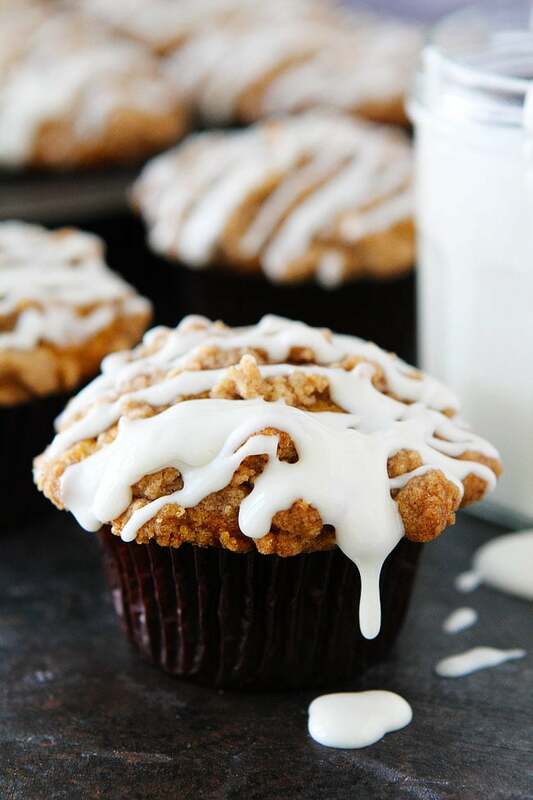 Pumpkin Cream Cheese Muffins with a cream cheese filling, streusel topping, and a sweet cream cheese glaze. 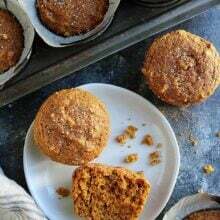 The BEST pumpkin muffin recipe EVER! I have made a million pumpkin recipes in my life and I am always looking for new ones to try. My friend told me about a local bakery that makes pumpkin muffins with cream cheese in the center. She said I needed to try them because they are her absolute favorite. Instead of going to the bakery, I got baking in my own kitchen. 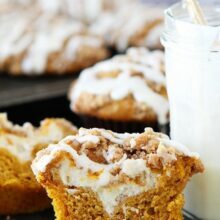 I made Pumpkin Cream Cheese Muffins with a cinnamon streusel topping and a cream cheese glaze. A huge thanks to my friend for the idea because these muffins are off the charts good! 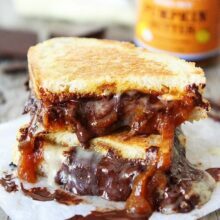 I am a sucker for pumpkin anything, have you seen my favorite 25 pumpkin recipes? Yeah, I LOVE them all. 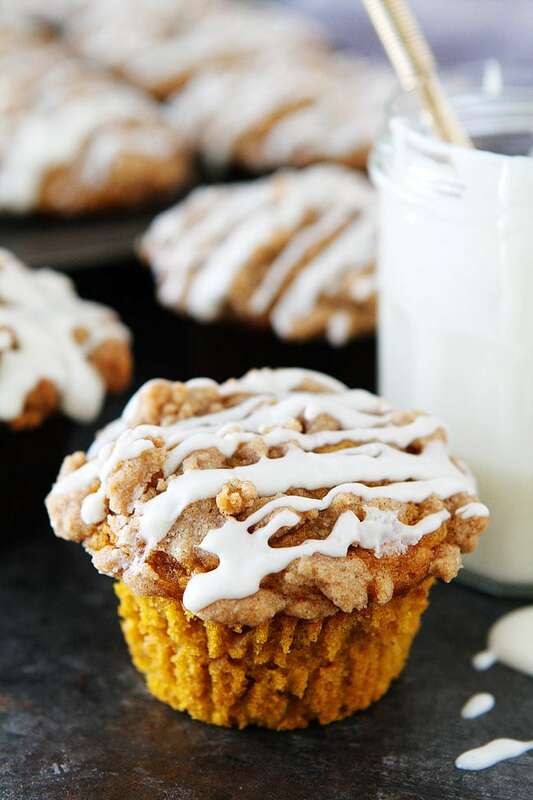 Well, these pumpkin muffins need to be added to that list because they are a new favorite! So let’s get down to business. Why do I love these pumpkin muffins OH so much? They are filled with a cream cheese center. 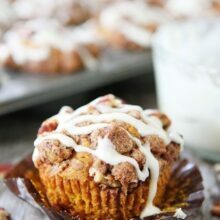 They are topped with the most amazing cinnamon streusel topping. They are finished with a sweet cream cheese glaze. Our family loved the muffins, but I wanted my friend to taste them to see if they lived up to her favorite bakery muffins. Well, good news, she said they are WAY better than the bakery muffins. She couldn’t believe how good they were! Mission accomplished! 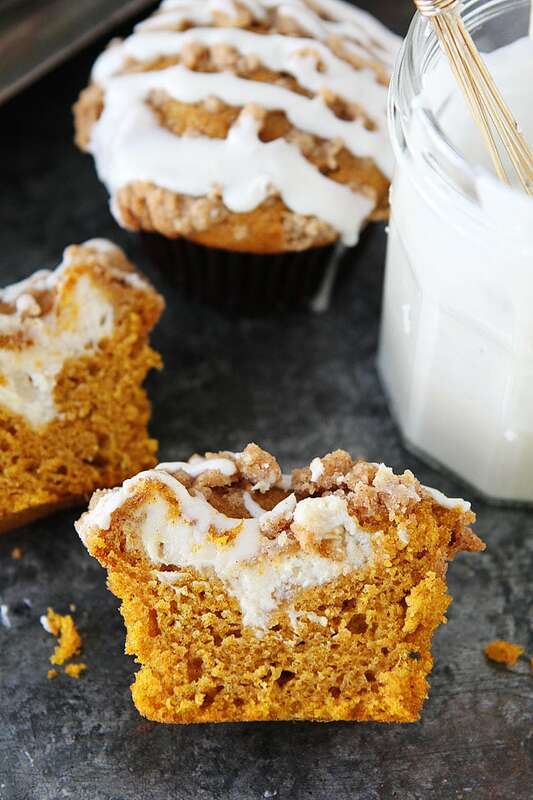 Make Pumpkin Cream Cheese Muffins part of your fall season. You will LOVE them! 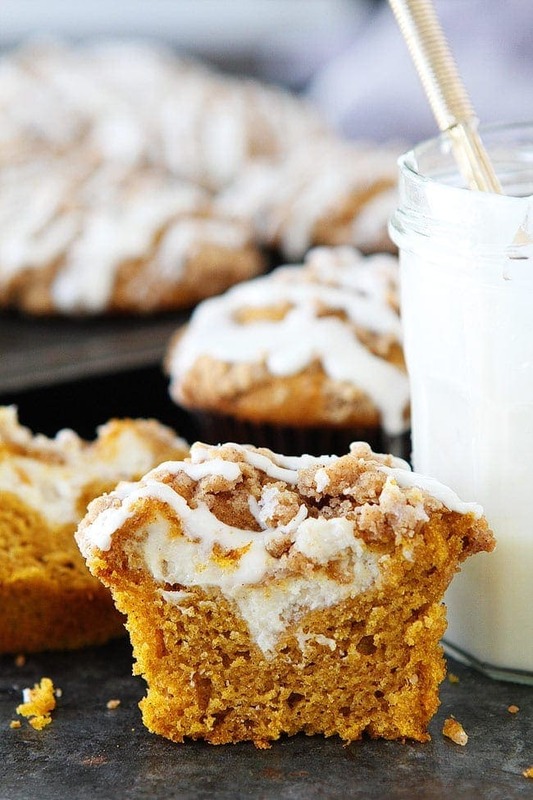 These are the best pumpkin muffins! They are great for breakfast, brunch, or dessert! First, make the streusel topping. In a small bowl, combine the flour, brown sugar, cinnamon, and butter. Cut the butter into the mixture using your fingers until mixture is coarse and crumbly. Set aside. Next, make the cream cheese filling. Using a mixer, beat the cream cheese, sugar, and vanilla extract together until smooth, about 2 minutes. Place in the fridge while you make the muffins. In a large bowl, combine the pumpkin, sugars, oil, buttermilk, eggs, and vanilla. Stir until smooth. Gradually add the dry ingredients to the pumpkin mixture, and stir until just combined. Fill each muffin cup with about 2 tablespoons of batter. Add a heaping spoonful of the cream cheese mixture to each muffin. Top the muffins evenly with the remaining batter, about 3/4 way full. Sprinkle the streusel topping over the tops. Bake muffins for 23-26 minutes, or until a toothpick stuck in the middle comes out with just a few crumbs. Let cool completely. While the muffins are cooling, make the cream cheese glaze. In a medium bowl, whisk together the cream cheese, powdered sugar, vanilla extract, and pinch of salt. Whisk until smooth. 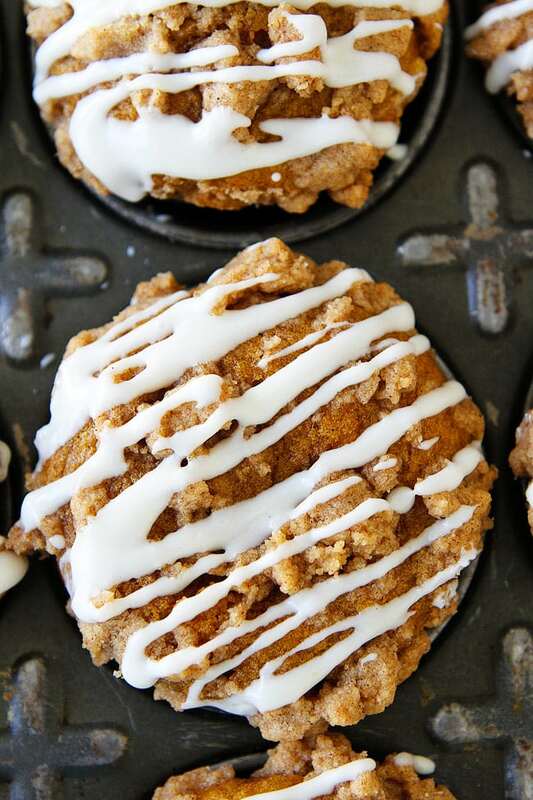 Drizzle the cream cheese glaze over the cooled muffins. Serve. Note-store the muffins covered on the counter for up to 2 days. You can store them in covered in the fridge too, just let them come to room temperature before eating. Can i use pumpkin pie spice instead for the ginger/cloves/nutmeg? If so, how much and would the cinnamon stay the same? Thanks! I NEED to try one of these…they look UNREAL!! Made these yesterday and they are delicious! I omitted the glaze, because I didn’t feel like I needed it (although it would have been great). If anyone feels the need to do this, just make sure to press in the streusel topping slightly before baking so it doesn’t crumble off so much afterwards. I thought the spices were perfect as is. I don’t feel a substitution of pumpkin pie spice would be just as good, because you can’t control the proportion of spices. Thanks for the recipe. Just put these in the oven. Seems like way too much batter, filling and topping for 12 standard sized muffins. It makes 12 for me every time. If you want smaller muffins, you can make more, but I find 12 to be just right! Recipe looks great. How much milliliters is one cup? All self-control would be lost if I made these muffins, I would eat ALL of them! Glad you liked the muffins! What size pumpkin purée should be used? You need one cup and a 15 oz can will be enough. I love it. I make this pumpkin cream cheese swirl bread, and it would be awesome used as muffin like this! I love the addition of the struesel on top, and I have been meaning to make this maple cream cheese frosting and I just wasn’t sure what to put it on. Now I know! And there is no way I could only eat one of anything. Not a chance. Can this be made in a 9×9 or 8×8? Not a bad problem to have. Thank you for the recipe. You are welcome! Glad you enjoyed the muffins! Made these for thanksgiving morning breakfast. They are so delicious. The recipe was very easy to follow. The muffins are the perfect balance of pumpkin sweet and moistness. Will save this recipe and make time and time again. Thank u for yummy food! Hi, I tried these this past weekend. I followed the directions to the T- however, the cream cheese kept blending with the rest of the batter while baking. So there was no cream cheese filling in the end. Any idea why? There should be a cream cheese center, see the photos. What brand of cream cheese did you use? Could you taste the cream cheese? Is there any nutritional information available for these muffins? Thanks! My family devoured these. A nice mix of spices and pumpkin. I went a little heavier on the cloves and nutmeg and it was not over powering. 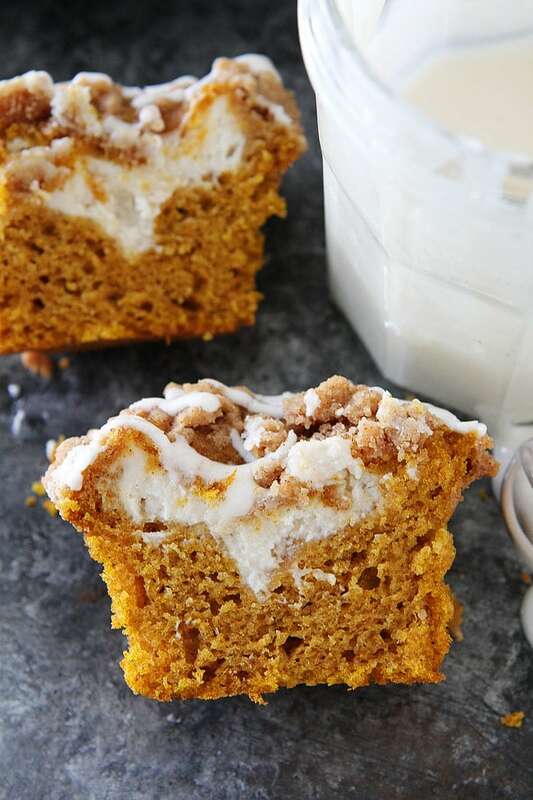 I will be making these my pumpkin muffin go to. Yum, so good! My only issue was that my muffins seemed to swell with the cream cheese center and all caved in when I took them out! I did have to substitute 3x baking powder for soda as I forgot that I just threw it away, oops. I am hoping that was the only issue and will try again with real baking soda soon. How much pumpkin pie spice do I use to substitute for the other spices ? I remember seeing a recipe for some sort of cream cheese filled muffin a few years ago where you mixed up the filling, rolled it into a log inside of a piece of parchment, froze it, and then sliced the filling into equal pieces to drop in the muffin tins. I’ll be trying that out when I bust this recipe out for a work treat. Have made these multiple times, and they are delicious! Even though there are multiple steps with filling and topping, they come together relatively quickly. My family loves them. these are delicious! A huge hit with my friends and family. These muffins are fantastic. I did have to add a 1/2 tsp of milk to the glaze though as it was runny enough to drizzle. Tried these yesterday! They are perfect! I would try adding the amount of spices in the recipe and use that amount of pie spice. I have done that in other recipes. I haven’t tried these yet, but I hope to using Pamela’s Gluten free baking mix instead of regular flour. I’m following your recipe, but making it into a loaf of bread. Has anyone else tried that method? I’d love to hear your thoughts. I love these muffins! I made them dairy free and gluten free! The spices are perfect!! Thanks for a great recipe!